I haven’t posted much in the last while. Mea maxima culpa, but I have an excuse reason. Since theshow opening, I’ve been getting things ready for the largest provincial Fine Craft Fair in mid-November. This means not only making more stock than is reasonable to make in a month, but also putting new things through the Craft Council Standards Committee. Things I hadn’t even really had time to THINK about. And I had less than a week to get them ready. So I spent four days madly putting together the ideas that had been percolating in the recesses of my over-worked brain and doing up the voluminous paperwork that goes with such things. Got stuff done, in and it all passed. Great. Note: rant below on the idiocy of certain deadlines. Skip at will. In the meanwhile, there are two big deadlines for October 31st (and art procurement deadline and a workshop submission deadline). I cannot for the life of me figure out why October 31st is so popular in the art community. Every year it’s the same thing. I figure it must have something to do with the trend in Newfoundland to assume that nothing will happen during the summer. When September hits, there’s a mad panic to get back on track, so deadlines get assigned.October 31st must be the default; Sept 30 would be too early and November 30 would mean doing actual work during December, when all one ought to think about is the holidays. Sorry for being so cynical, but every year I get mired in paperwork and deadlines by people who decide in September that things should be done by the end of October. Why not (dare I say it) assume that professional people will meet a deadline of August 31st? We don’t all spend months at a stretch in our cabins. It’d be nice, but most of us work for a living. Right. I feel better now. Anyway, those deadlines loom. 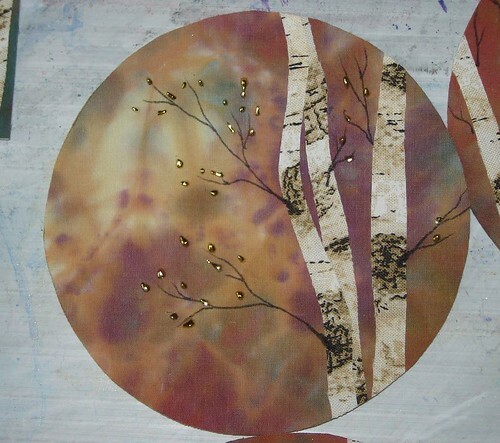 The biggest provincial hig-end Craft Fair is coming up mid-November. I’ve been running flat-out getting ready. So far it’s going quite nicely. I even have quite a few new products, variations on past years’ ideas and have revamped my paperwork. Finished a brochure yesterday, redid my tags and am upgrading my hanging mechanisms for finished pieces. All told, it’s going very well, I’m just going out of my head. Luckily lawyers have similar deadlines, so John is keeping me company late into the night. 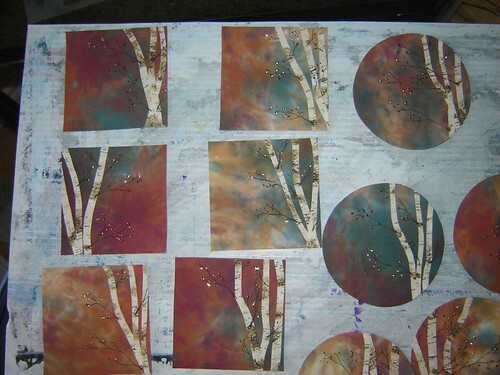 I love your Foiled Birches. The earth toned backgrounds are scrumptious.